i just can't seem to help myself. even though there about a thousand other things i could make with leftover, slightly overripe bananas – banana pudding, banana cream pie, smoothies, banana upside-down cake, to name just a few – i always come back to banana bread. this version, flavored with lots of sweet, warming, licorice-like star anise and crunchy, buttery cashew nuts is so simple, but it's absolutely divine. the slightly spicy anise is the perfect complement to the richness of the cashews, and the crunch from the nuts adds welcome texture. preheat the oven to 350 °f. prep a loaf pan by lining it with parchment paper (leaving a little overhang to help you easily pull out the bread later) and spraying it lightly with nonstick cooking spray. In a large bowl, whisk together the dry ingredients: flours, baking powder, baking soda, salt, star anise, ginger, and flax seeds. set aside. in the bowl of stand mixer fitted with a paddle attachment, cream together the coconut oil and sugars. mix on medium speed until fluffy and well combined, about 3-5 minutes. add eggs, one at a time, mixing in between each addition. add the vanilla extract, apple butter, and mashed bananas and mix again until just combine. slowly add the flour mixture to the wet ingredients in the bowl. add about a third of the dry ingredients at a time, mixing lightly between each addition. after adding the last portion of the dry ingredients, mix again until just combined (leaving a few small lumps is totally okay). then gently stir in chopped cashews. pour the batter into the prepared pan and bake for about 45-50 minutes, or until a toothpick inserted into the center of the bread comes out clean. 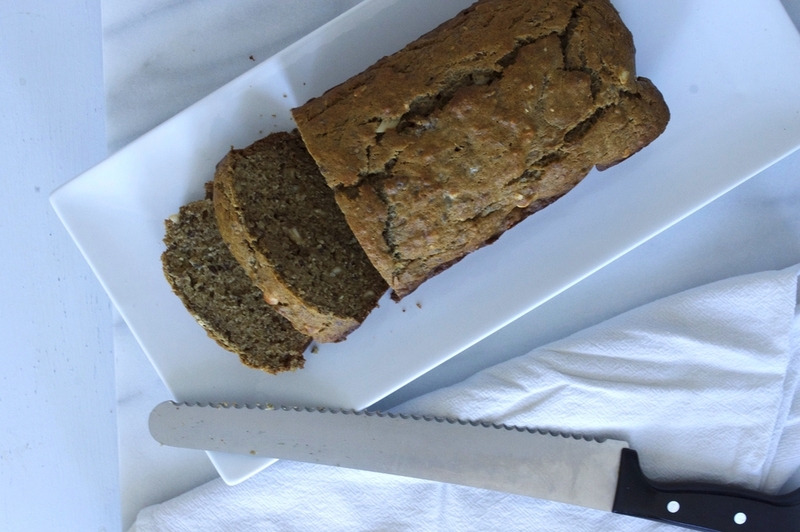 make sure to let the banana bread cool for 15-20 minutes before slicing and enjoying! this spice-and-nut combo is especially delicious alongside a steaming cup of black tea (and makes a tasty breakfast or afternoon snack!). it also freezes extremely well – so if, like me, you never seem to finish a whole loaf before it starts to go bad, wrap half the loaf tightly in two layers of plastic wrap after it has cooled and store it in the freezer – it'll last in there for a good 6 months, so you won't have to waste a bite!